Find out how to REVERSE ALL of these health problems... and more! Find out what may be making you acidic... and it’s not just the foods you eat. 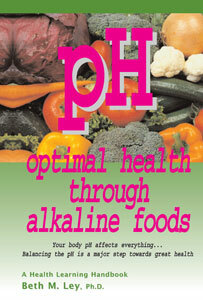 Find out which foods are the most alkaline and which are the most acidic. Nutritionist and author Dr. Beth gives you the simple facts so you can quickly raise your pH to healthy levels and helps you to understand why it’s so important.